Pretty house in Sardinian style a step away from Budoni and San Teodoro. Property 2: Pretty house in Sardinian style a step away from Budoni and San Teodoro. Property 13: VILLA DELFINA ROSA 350 mt beach. ROMANTIC & FAMILY HOUSE. 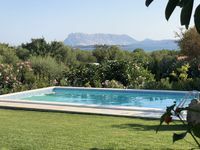 Property 14: SARDINIA - CAPO CODA CAVALLO - Villa 150 meters from the sea. 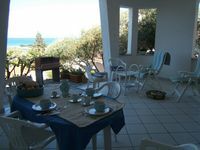 Stunning Villa with "PRIVATE HEATED POOL" ,500 meters from the beach, A/C,Wi-Fi - "VILLA STIGE"
Property 43: Stunning Villa with "PRIVATE HEATED POOL" ,500 meters from the beach, A/C,Wi-Fi - "VILLA STIGE"
Beautiful garden and breathtaking views of beach! We are pleased with our stay and the hosts were helpful for anything we needed. The interior of the property is more vintage and charming but the outside is what make this villa unique. The well maintained pool, nice bbq station, beautiful beach view (walking distance) and lounge chairs for ultimate relaxation. Thanks again!